The 9th Satoke Elephant ceremony was held February 14-16 at Suan Pa Tung Kwean, Tung Kwean Forest Garden at the kilometer 25 and 26 markers, Lampang - Chiang Mai Road, in Hang Chat District, Lampang. Province. 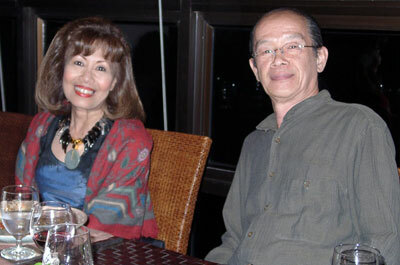 Saengdao Singlah and Supan Manpean from Lampang, Pornpimol Porkha and Teeraphan Boonkasem couple from Chiang Mai, and Dana Hopestone and Kim St. John Woodward from the USA had a Valentine’s Day they will never forget. 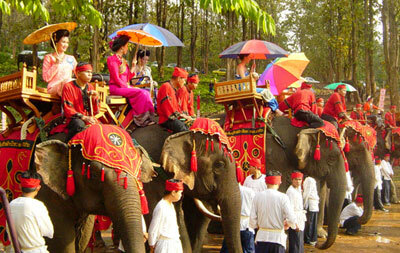 The three couples were married on elephant back during the 9th Satoke Elephant Ceremony in Lampang. Shown here is the “parade of beauty” to bless the couples before the ceremonies began. 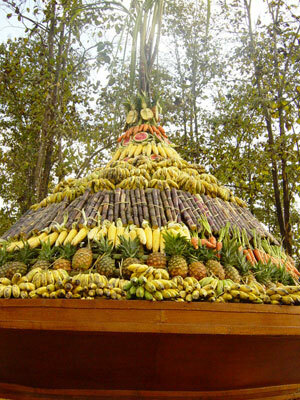 The festivities included a Lanna wedding ceremony on elephant back, flower carts contest, Lanna style elephant parades, elephant shows, and the Forest Industry Organization’s local product stalls. The highlight of the Valentine’s Day activities was the wedding ceremony on elephants. 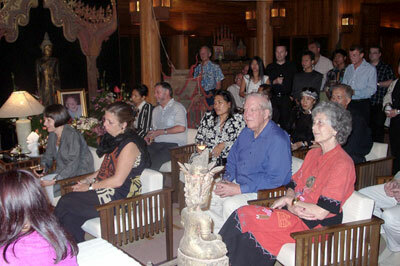 Three couples were married, Saengdao Singlah and Supan Manpean from Lampang, Pornpimol Porkha and Teeraphan Boonkasem couple from Chiang Mai, and Dana Hopestone and Kim St. John Woodward from the USA. 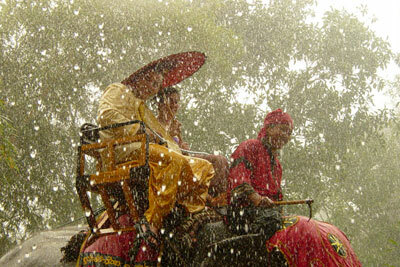 During the elephant parade, heavy rain began to fall and lasted about 10 minutes, letting up just before the wedding ceremonies began. But even this did not dampen the couples’ spirits, as some of the Westerners even believe that rain is a blessing for their wedding ceremony. The Satoke Elephant ceremony was organized by the Lampang Provincial Authority, the National Elephant Institute, under the royal patronage of HRH Princess Galayani Vadhana, the Elephant Conservation Center, and the Lampang Satoke Elephant Foundation to raise funds for the elephants’ food and medicine. Lampang Governor Chalermpol Prateepawanich gave a flower wreath to the couples after everyone (except the governor) got wet. The Sa-toke (container) was filled with food for the elephants that took part in the parade; the elephants ate it all after the wedding ceremony. The “mango rains” gave the couples a quick blessing on their special day, and let up just in time for the wedding ceremonies to begin. Satoke is a local container filled with Northern food (in Chiang Mai called Kantoke). The Satoke Elephant ceremony provides lunch and dinner for a number of elephants. This was first held on February 3, 1995. This year was notable in that it was the first time that Satoke Elephant feeding, floral blooms, elephant gatherings day, and Lanna weddings on elephant back were held together, having previously been separate. Valentine’s Day 2003 is not only a day for lovers but also a day to renew friendships and contacts you have made during the year. 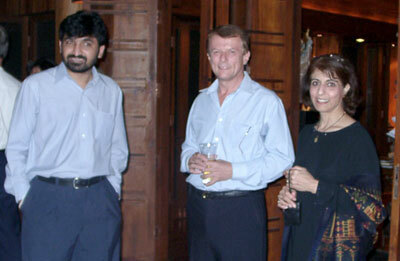 From right: Dr. Christian Velder, Mrs. Roshan Dhunjibhoy, Ajarn Tosporn Kasikam, his son, and Hagen Dierksen. Mathew Abraham, the Consul of India, really seems to enjoy the presence of two beautiful ladies, the wife of the Hon Consul of Canada, and his very own. Saweng Crueaviwatanakul, managing director of Wangcome Hotel in Chiang Rai and the Chiang Inn Hotel, is now also the newly appointed Hon. 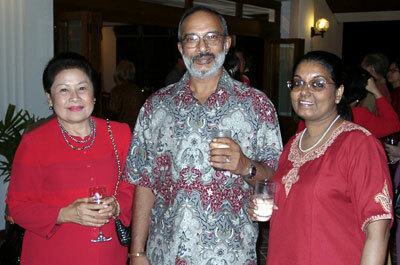 Consul to South Africa, and decided to spend Valentine’s night with his daughter Ring at the Party. 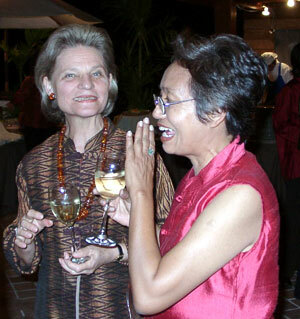 “Have you heard?” The Gossip Corner is open: what is Khun Padee Buchart, Hagen’s secretary, whispering while Mrs Felder listens? 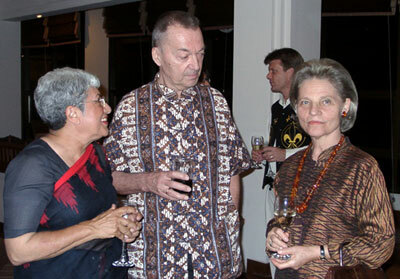 Mr Hagen E. W. Dierksen, the Honorary Consul of the Federal Republic of Germany, and his wife Wanphen took the opportunity to invite the diplomatic corps of Chiang Mai plus friends and business acquaintances to a reception and a meal at the romantic Saen Kham Terrace Restaurant. “We may have different opinions about life or families - we may come from different cultures but these differences should not lead to split our friendship.” This was the main theme of the night. Valentine’s, the day of love is a day to remember and cherish those people without whom everybody’s life would be a lot poorer. And it worked. Rather warm weather, splendid food, beautifully dressed Chiang Maians, and the warm welcome words of Hagen made a lot of people think about the current world situation, and all agreed that the different opinions of today’s world leaders should remind all of us to move closer together, be there for each other, and never let politicians split families, regions and friendships. One could indeed wish that also higher levels would have more of such understanding and common sense, as it was illustrated that evening. 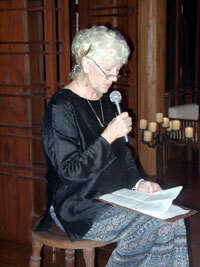 Friendship across nations, borders and religions is possible, and not only in Chiang Mai. Roshan Dunjibhoy tells one of her many stories from her time at the German television stations, where she was a celebrity of her own, to Mr & Mrs Felder. Roshan, of Indian origin with a German passport and a natural German slang, is still very active in and around Chiang Mai. 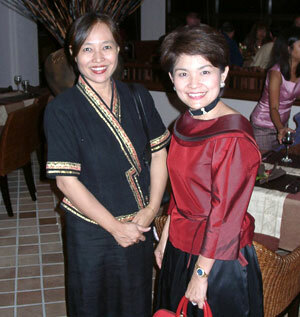 Dressed in a beautiful Lanna skirt was Tiamtip Kittiput, the landlady of Chiang Mai’s Tamarind Hotel. To her right: Padee Buachart, Hagen Dierksen’s assistant, and Shigeyuki Suzuki, the Consul of Japan. Men talk, or gossip as well? Shigeyuki Suzuki, the Consul of Japan, Sirin Nimmanheminda, chairman of Niyom Panitch Group, and David Hopkinson, director of the British Council Chiang Mai, and Honorary Consul of the UK and Ireland. ML Thepin came all the way from USA, and keeping her company is Dr Anun Seetapun M.D., F.A.C.S., a certified cosmetic surgeon from the American Board of Plastic Surgery. 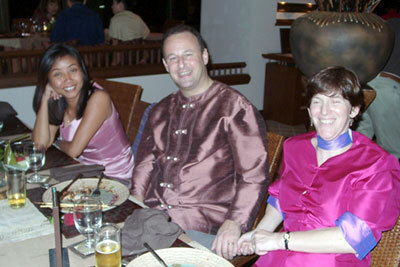 Appropriate for Valentines Day: A thorn between two roses Eric S. Rubin, Consul General of the USA, Chiang Mai, seems to enjoy being seated between his own wife (right) and David Hopkinson’s wife. Friends care for each other! 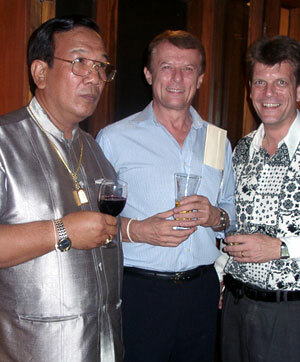 Never let different opinions of World leaders get in the way of our friendship here in Chiang Mai. Hagen Dierksen gives his welcome address on Valentine’s Day. Where else but in Chiang Mai can you see so many beautiful Lanna Style dresses in one place? Kh. 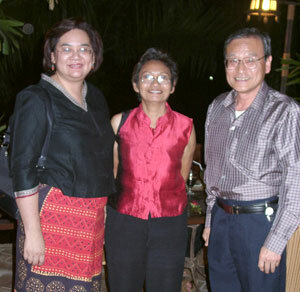 Poo, wife of Thomas Baude, director of Alliance Francaise, and Yuthapong’s wife. 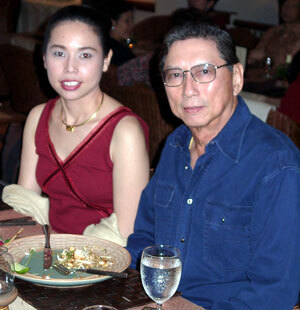 Utta Bhirombhakdi, Singha Brewery, together with his Valentine companion enjoy the splendid food at Saen Kham Terrace. It was called: The artist’s corner. 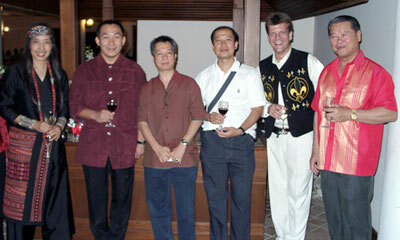 Wanphen, Yuttana Mohprasit, nickname Dop, the Interior designer of Saen Kham Terrace, Vichit Chaiwong, owner of Gong Dee Gallery, Attaporn Tichinpong, Interior Design editor of Baan Suan Decoration Magazine, Michael Vogt, MD Chiangmai Mail, and Nit Wangviwat, the Honorary Consul of Canada. 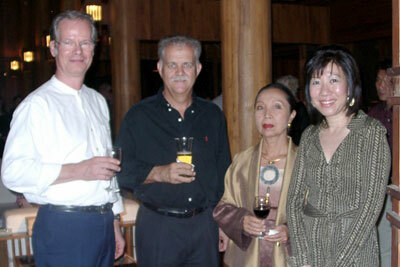 Enjoying the multi cultural food and German wine (from right) are Ring from Chiang Inn Hotel with her Dad, the Hon. 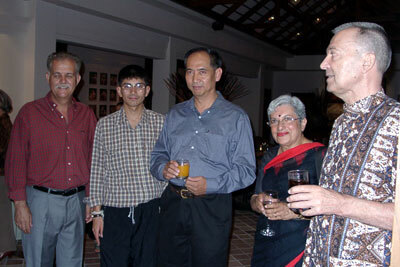 Consul to South Africa, Pravit Arkarachinores, the Hon. Consul of Austria, Hagen Dierksen, Mr Zang Guo Qing, the Consul General of the Peoples Republic of China, with his lovely wife, the always smiling Nit Wangviwat and Khun Sirin Nimmaheminda. 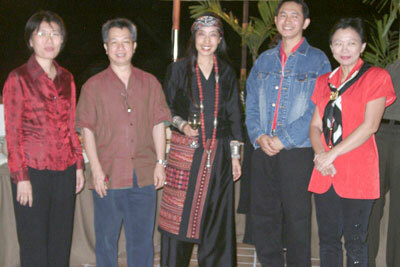 Posing for Chiang Mai Mail (from left): Ajarn Miang, an accounting professor at CMU, Vichit from the famous Gong Dee Gallery, the lady in the most fashionable outfit of the night, Wanphen Dierksen, Santi Chanonsuang, an artist of traditional Lanna paintings and Dr. Nong, one of the best physiotherapists in town. 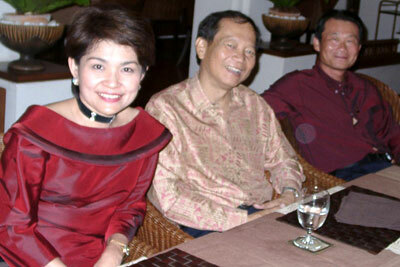 Yuthapong Jeeraprapong (2nd left), vice chairman of the Federation of Thai Industries, Chiang Mai Chapter, with his beautiful wife to his left, next to him in red Sir Vorakit Yuthapong, head of the YMCA and former Consul of Sweden. Are the 3 ‘diplomatic’ ladies talking fashion? 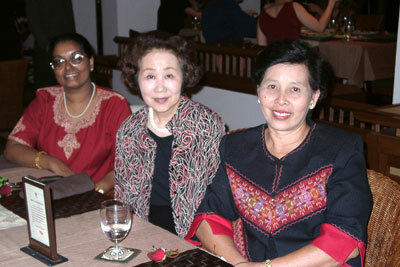 Wives of the consuls of India, Japan and Sweden. It looks like a fun night and it was a fun night for everyone - 3 consuls and the offspring of one of them are definitely not discussing world politics but something far more entertaining; from left: Austria, South Africa, and Germany. Last Saturday saw one of the most fascinating events, as a memorial party was held at the ‘Twelve Gables’ estate for the philanthropist Gary Dilley, who suddenly passed away on February 1. A retired banker and chairman of the Foundation for the Education of Rural Children, Gary was a polio survivor and especially sensitive to the needs of disabled people. He led the foundation through its formative stages and was instrumental in all of their building projects. 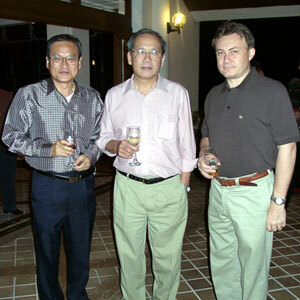 Norachai Prasertmanukitch, Chairman of the Board of Chiangmai Mail, Peter Filgur, and Michael Vogt, MD Chiangmai Mail. 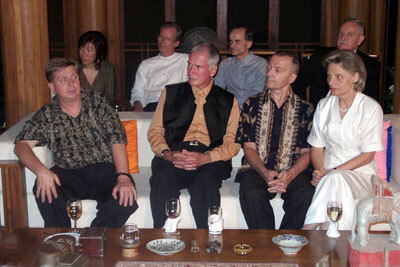 Front row (L to R): Lars Magnusson, Chiang Mai; Dieter von Boehm-Bezing, Chiang Mai; Dr. Christian Velder, Chiang Mai; Hanna Velder, Chiang Mai. 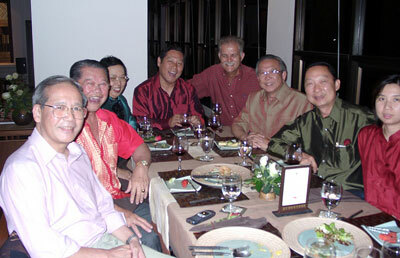 Back row: Julinda Morgan, Singapore; Wolfgang Roese, Chiang Mai; Jon Morgan, Singapore; Harold Vickery, Jr., Bangkok. One of the most graceful dancers, performing the final farewell dance for Gary. Boonlert taking care of Norachai and his lovely family. When memories of Gary were shared, everyone was listening in anticipation. The evening was held at Gary’s house, and was well attended by not only members of the Foundation, but also by a number of friends and acquaintances from all over the world. Gary, who will always be remembered as a very special and unique personality, loved to welcome and entertain guests in his house, and Renee Vines, board member of the Foundation and close friend, as well as Celeste Tolibas-Holland, set the scene for a light-hearted party rather than a somber remembrance. As it was felt by all those attending, Gary truly enjoyed it. Various friends, among them Renee Vines, Deborah van Dijk, Jerry Rose, Hagen Dirksen, Frank Weicks, Peter and Ann Dawson, shared a number of moving and humoristic stories about Gary. For the final farewell, an elegant candle dance was performed by the most graceful dancers, moving slowly up the shrine, and giving a series of “wais” to tell him goodbye. It was as beautiful as it was touching, and Gary would have just loved it. Gary, wherever you may be, may your parties be as joyful and entertaining as we remember them in our hearts. Keep on laughing, as we will continue to care for those you loved, and for those you have brought smiles and laughter to. Farewell, Gary, we miss you! Sharing one of many stories is Renee Vines, close friend and member of the Board of the Foundation for the Education of Rural Children. Sharing fond memories about Gary are Nisar Ahmed and Peter Filgur, both Gary’s business associates, and Ms. Asra, a friend from New York. Enjoying each other’s company - Wolfgang Roese, Lanna House Antiques, Hagen Dirksen, Honorary German Consul, Suchid von Boehm-Bezing, Chiang Mai, and Julinda Morgan, Singapore. 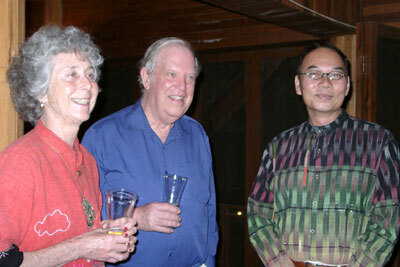 Carol & Bob Stratton, Vermont, USA, together with Ajahn Witti, Faculty of Art, Chiangmai University. Business talk? 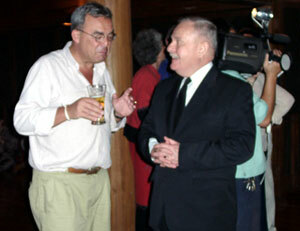 Hanno van Veen, left, banking associate from Amsterdam, chatting with Harold Vickery, Jr., Lawyer from Bangkok. 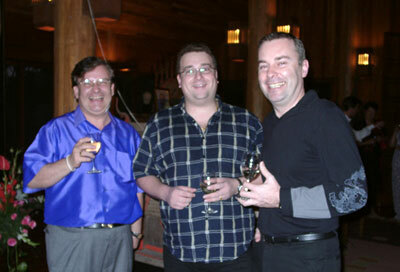 Having a good laugh on Gary’s behalf (left to right): Norman Allin, Pacific World; Matthew Slater, Asalon; Ulf Buchert, Oriental Express. Wine tastings are popular because they override the limitations of sampling wine alone, at home. How many wines can you taste on your own unless you don’t mind throwing away nine-tenths of every bottle? How many wines are you willing to buy on your own? And how much can you learn tasting wine on your own or with few friends whose expertise is no greater than yours? 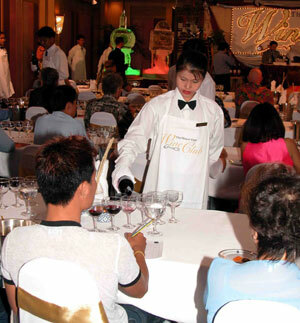 Wine-tasting session at the Royal Cliff Wine Club in Pattaya. 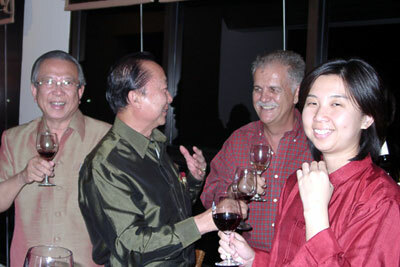 Wine tastings organized by wine clubs, merchants and wine societies are events designed to give wine enthusiasts the opportunity to sample a range of wines. These events can be seminar-like events (seated) or they can be more like parties (tasters milling around informally). Compared to a wine appreciation class, the participants at a wine tasting are more likely to have various levels of knowledge. Tastings don’t come in beginner, intermediate and advanced levels - just one size fits all. 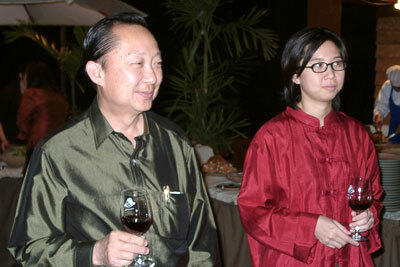 At a wine tasting, you can learn from the professionals who organize the event as well as from your fellow tasters. You have the added advantage of making new friends who share your interest in wine. Most importantly, you can taste wine in the company of some individuals whose palates are more experienced than yours, which is a real boon in training your palate. I have led and attended literally hundreds of wine tastings and I can honestly say that I have learned something about wine at almost all of them. If you have never been to a wine tasting, don’t feel intimidated. Familiarizing yourself with few wine tasting etiquettes will help you feel more comfortable. Otherwise you are likely to be appalled when you see people slurping and spiting in public. Why are those people behaving like that? Do you have to make loud slurping or gurgling noise that you hear “serious” wine tasters make at tastings? Of course, you don’t. But the drawing of air into your mouth does enhance your ability to taste the wine. With a little practice, you can gurgle without making loud, attention-grabbing noises. To spit or not to spit? If you swallow every wine you taste, by the time you reach wine number nine or ten you will be far less thoughtful to make a judgment about the wine. So spitting is acceptable. 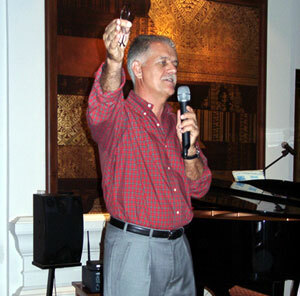 In wineries, professional tasters sometime spit right onto the floor or into the drains. In more elegant surroundings, you spit into a spittoon, usually a simple container like a large bowl (one per taster) or an ice bucket that two or three tasters share. At first, naturally, some tasters are reluctant to spit out wine. Not only have they been brought up to believe that spitting is uncouth, but they have also paid good money for the opportunity to taste the wine. Why waste them? Well, you can drink all of your wine at a wine-tasting if you wish - and some people do. But I don’t advise that you do, for the simple reason that evaluating the later wines will be difficult if you swallow the earlier ones, as the alcohol you consume will cloud your judgment. Smoking is a complete no-no at any wine tasting and using strong scents - perfume, aftershave and scented hair spray are undesirable as these smells can interfere with your ability to detect the aromas of the wine. Courteous wine tasters also do not volunteer their opinion about a wine until other tasters have had a chance to taste the wine. Serious tasters like to form their opinion independently and are sure to throw dirty looks at anyone who interrupts their concentration prematurely. To attend a professionally organized wine tasting, look out for good wine clubs, wine schools and other organizations in your area. Your local wine merchant may be able to guide you in the right direction. They might even sponsor wine tasting events occasionally apart from the informal sampling opportunities they offer in the store. A prominent facet of the destructive nature of HIV/AIDS is its tendency to leave behind disjointed family units that are forced into economic instability. In Thailand, financial challenge occurs to some degree for nearly every person influenced by the disease. A typical story might be an AIDS infected individual who becomes too weak to maintain an existing profession, or is disallowed to continue working by a previous employer. Also common are widows, orphans, or grandparents who are suddenly left without a reliable source of income. In these scenarios, individuals who have avoided becoming infected themselves are nevertheless challenged by AIDS in obtaining basic necessities such as food, medication, and educational supplies. Personal economic hardship resulting from the disease is especially prominent in Chiang Mai, as the area was the early epicenter of the HIV/AIDS epidemic in Thailand. The province has thousands of stories involving grandmothers unexpectedly needing to support grandchildren, aunts and uncles suddenly faced with twice as many children to feed, and infected income providers needing new means of livelihood. However, the problem is being tackled in interesting ways on a local level via initiatives designed to promote self-sustainability among those infected or affected by HIV/AIDS. Organizations such as Rejoice Urban Development Program have formalized programs that foster small-scale business initiatives designed to allow individuals to help themselves. 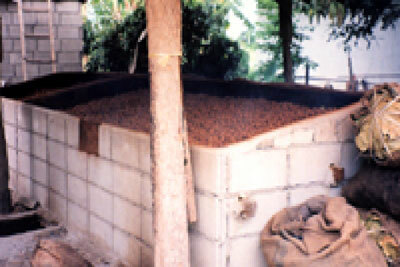 An example is Rejoice’s Sustainable Development Project, which makes micro-credit available on a loan or grant basis to persons with unique business ideas. The typical loan is 6000 baht, which is used to finance equipment and marketing start-up costs of a new business. Terms of repayment are 500 baht per month interest free. To-date, the financial results of these entrepreneurial initiatives have been astounding. 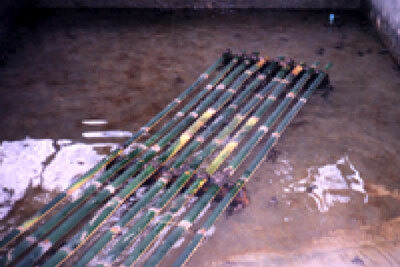 For example, a frog farm developed under the Sustainable Development Project became profitable within 1 year, and is now experiencing operating margins of 30%. 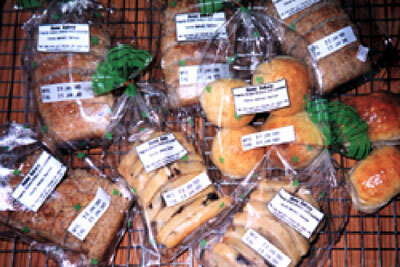 Similar projects currently in different states of profitability include a private electrician business, handcrafted stationary and greeting card manufacture, a mobile sausage and salad kiosk, retail egg sales, and a scrap, recycling business and just recently Rejoice started a sustainable development bakery. Rejoice additionally provides managerial assistance to these enterprises both from its Chiang Mai office staff and through its global network of volunteers, many of whom are successful businesspeople. Rejoice has received gracious donations from the Canada Fund and the Elton John AIDS Foundation UK and private individuals in order to operate the Sustainable Development Projects. Projects such as these simultaneously provide a critical source of income to those suffering unexpected misfortune while allowing personal energy to be channeled toward something other than the disease. An interesting by-product of the Sustainable Development Project is its impact on overcoming societal misconceptions surrounding HIV/AIDS. The public increases its understanding that infected individuals and decimated families can remain productive members of society. Witnessing vibrancy in those infected and affected by the disease not only revises community attitudes, but also results in increased general public support for HIV/AIDS outreach programs. Publicity surrounding HIV/AIDS typically focuses on its global scale and medical advancements in fighting the epidemic. Although presenting the big picture is critical in maintaining global attention, it is the millions of small-scale success stories of those coping with the disease that make every effort meaningful. We truly appreciate any help you might offer our campaign. All donations will greatly impact our fundraising target and will ultimately benefit the lives of many afflicted people. If you or someone else you know is in a position to help our cause, please contact us with your pledge commitment today. Donation Suggestions: $10, $25, $100, more? Donation Cheques can be mailed to: Rejoice Urban Development Project, 70/1 Amarin Court, Klong Cholarpratan, Moo 6, T. Suthep, A. Muang, Chiang Mai 50200, Thailand. Contact by e-mail at contact @rejoicecharity.com with your contribution pledges. If you prefer, you may contact us directly at tel./fax office: (053) - 806 - 227, mobile: (06) - 1922 - 128.